"From the first meal I have not looked back. I have regained the lost weight, my black coat is magnificent, and I am full of energy." I am Lulu, a black Labrador. I was born on 28th May 2014. I live with Carol in rural Herefordshire, and I am a PAT dog. The charity Pets as Therapy supplies approved dogs (and cats) to care home, hospices, hospitals and schools. I go and visit residents in two local care homes. I have always been a bit of a “sicky” girl, but a few months ago this became a major issue. I lost weight, my coat was dull, I felt tired. I could not go into the homes. 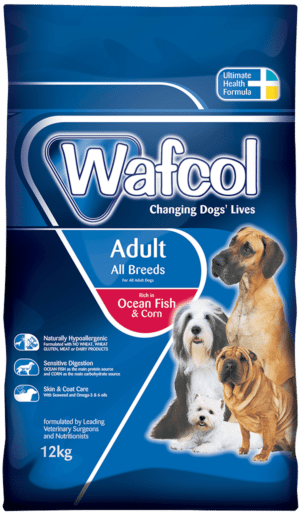 After extensive tests, the vet concluded that I had a food allergy and recommended that I was offered Wafcol Ocean Fish & Corn. No treats, just water to drink. From the first meal I have not looked back. I have regained the lost weight, my black coat is magnificent, and I am full of energy. The care home residents comment how well I look. I have been selected as one of six finalists to go to Crufts March 2019, to choose Champion Pat Dog of the Year.